Just 20 minutes from the dock at Cabras Marina is the most requested dive site on Guam. It’s called the Blue Hole because it is a crater in the reef. The amazing part is the heart shape to the opening at the top of the hole. You may not recognize the heart on the top but once you are in the hole and look back up you’ll see the distinct shape. The water is always warm, the seas are generally calm and the diving is varied. Many of the dive sites are introductory level for Open Water Certified Divers. Guam also has sites that are more advanced. The top of the Blue Hole is at 50 feet. 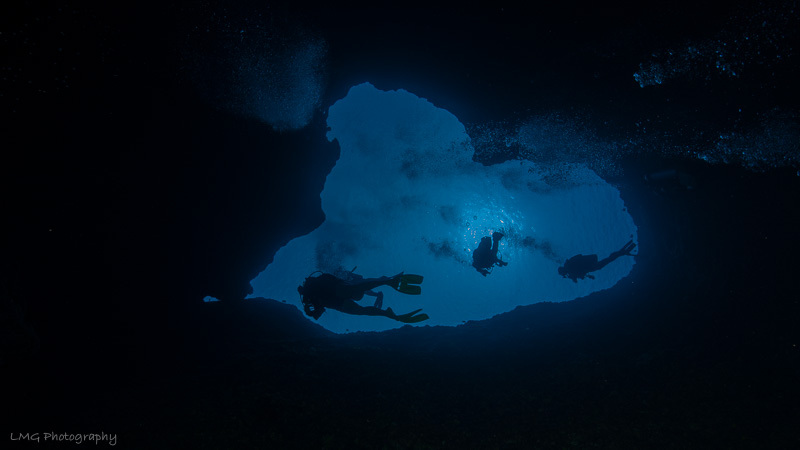 Once you drop into the Blue Hole a favorite to the dive is a window at 125 feet that opens into wide open ocean. The divers call diving through the window “Shooting the Hole”. It’s a good idea to watch your depth gauge as the bottom of the Blue Hole is over 200 feet deep. This is way below recreational limits and you will need to have a special certification to dive past 130 feet. Divers often see Black Tip Sharks, Turtles, Octopus and large Snapper hanging around the Blue Hole. You’ll also be on the look out for Marble rays, Leaf Fish and Anemone Fish (Nemo). This is a fun drift dive off the boat and a good introduction to diving on Guam.